The Olympus E-PL3 Mirrorless Micro Four Thirds Digital Camera with 14-42mm II f/3.5-5.6 Lens puts the power to do more with your photos in the palm of your hand. Not only that, but the E-PL3 promises to do so, without weighing you down. Perhaps you're a die-hard Micro Four Thirds fan or you're simply looking for more versatility than a point-and-shoot can provide but without the weight of a DSLR rig. Olympus has heard the call and thus, has expanded their PEN line of cameras. This E-PL3 comes with an M.Zuiko MSC Digital ED m14-42mm II f/3.5-5.6 zoom lens. You can start shooting from day one with everything you need to make great photos. This versatile zoom gives you the coverage to shoot most subject matter, making it a great first lens. Using the Micro Four Thirds Mount, however, you can add any of the compatible lenses to the E-PL3 to customize the camera for the shooting you plan to do. In addition to the included lens, the camera also comes with an external flash for low light photography and a host of other essential accessories. Along with capturing RAW and JPEG images, the E-PL3 also takes 3D photos in the MPO format. And, as is one of the hallmarks of the Micro Four Thirds genre, the camera also records 1080/60i HD video in AVCHD or AVI Motion-JPEG formats. Up to 29 minutes of video can be recorded using the camera. Features like Live View and a generous 3.0", tiltable LCD screen help to capture even more dynamic footage with ease. Driving all this picture taking and movie making would be the 12.3Mp High speed Live MOS Sensor and the TruePic VI image processor. These two work in tandem to not only record remarkably detailed and bright images, but to do so quickly and efficiently, writing them to compatible SD/SDHC/SDXC, or UHS-I cards. Another helpful feature aiding in the image making process would be the in-camera image stabilization, which promises a cleaner image than image stabilization in the lens alone. Olympus' FAST AF System also does its part to help capture stunning images with its 35-point focus area; making it especially useful for shooting active subjects. Of course, art filters and other modes help add creativity to your memories, in camera. Additional in-camera editing features include the ability to make slideshows with sound, and the ability to preview effects as you adjust them. The E-PL3 also provides you the option to wireless transmit your photos or videos to email with optional, compatible cards, for computer-free transfer. What else you ask? Well, how about improved color reproduction, face detection with eye detect, 5 fps sequential shooting, and much more. 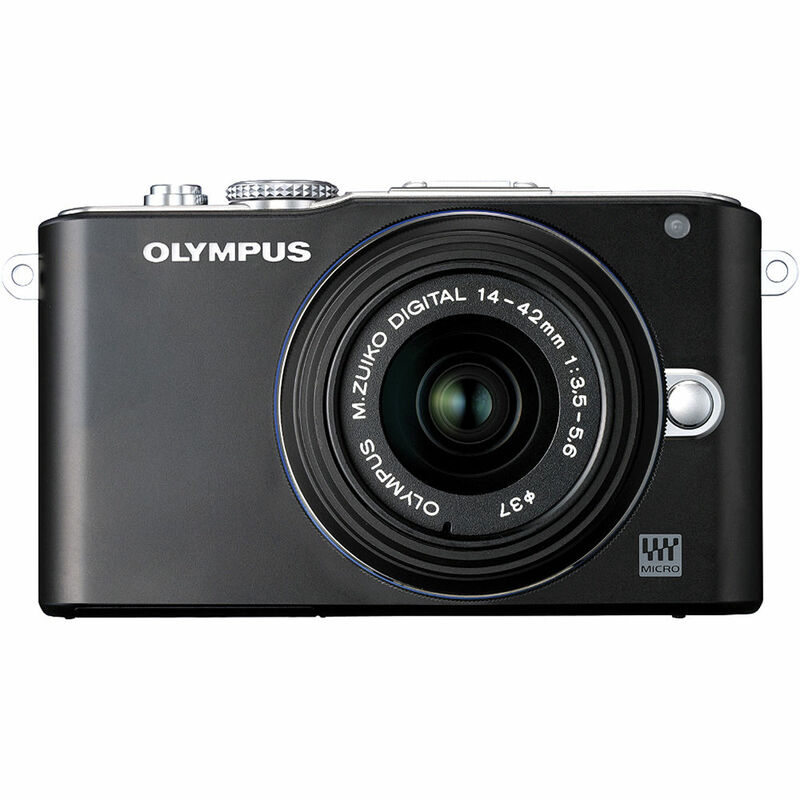 Olympus wants you to enjoy picture taking without feeling weighed down or locked into point-and-shoot. With their E-PL3, you can do just that. The E-PL3's Live Guide system allows you to preview effects as you adjust them - before the image is even captured. Simply select Live Guide and turn the wheel on the back of the camera to slide through numerous photographic effects, such as brightness, color saturation, tone, etc. Box Dimensions (LxWxH) 9.8 x 5.6 x 4.0"
E-PL3 Mirrorless Micro Four Thirds Digital Camera with 14-42mm II f/3.5-5.6 Lens (Black) is rated 4.6 out of 5 by 21. Rated 5 out of 5 by Edgar from excellent & versitile My third pen. Sold the ep2, but keeping the E-PL1 as a backup. Found E-PL3 picture quality slightly better than previous Pens, especially when it comes to white balance in artificial light and higher ISO.Love using my Leica M lenses and Contax lenses. Great size for travel with many lenses. Nikon 7000 & 5100 have somewhat better picture quality, almost enough to justify size and weight, but with the E-PL3 somewhat less. Important to use very good lenses. At lower prices panasonics are better than olympus lenses (ie. 14 - 45 and slim primes.). Hard to beat Olympus 12-60 however. Rated 5 out of 5 by Matt from Amazing quality at a fantastic value As an avid hiker, I was looking for a solidly built camera with SLR quality and control, with point and shoot size. The E-PL3 is perfect! The camera has a very high quality feel to it. The lens control is very smooth. Other micro 4/3 lenses i've played with felt cheap. The control functions for manual settings are a breeze. After playing with my new camera for only a few days, I was switching over to manual mode and taking beautiful photographs. The iAuto mode is very nice for someone who just wants to turn the camera on and start clicking away. Rated 5 out of 5 by Dmstraton from Nice, very nice! This is an exceptionally well built little camera, with fantastic AF, no shutter lag, good looks and very good ergonomics. I have a 5D II as my serious camera and wanted something smaller. I originally purchased a Panasonic GH2, a nice camera with good ergonomics and incredible features, but bigger than I wanted. I was never quite convinced by the color rendition which tended towards blue-green either, more post than I wanted to deal with. Read up on the new Olympus line up and it sounded interesting. I didn't find the tiny Panasonics my cup of tea - too much plastic. The build is great - solid, with some heft and a nice thumb grip - no cheap plastics for any key controls. Not a fully articulated screen but good enough and the image quality is very good, with nice accurate colors. The AF is astounding, really, incredibly accurate and crazy fast...blows my 5D away...with easy access to 35 focus points. Continuous tracking AF works very well. Continuous shooting surprisingly very good, and 5fps works as advertised - doesn't seem jam up the buffer as much as my GH2. Image quality I think is very good. Tried the kit lens and my 20 1.7 Panny. The kit was not too bad, certainly good enough and incredibly small and light, but the 20 is very good performer and better built. I have converted unaltered RAWs to TIFF and run these through my typical workflow. So far so good. The color rendition OOC is incredibly good. WB consistently excellent, exposure excellent. JPEGS look really good. I can't compare this new sensor to previous Pens, but I can to the GH2. I like the colour rendition better, and the DR seems very good, maybe a little better rendering of highlights. 12 MP is enough for what I wanted. No, I won't be comparing image quality to APS-C or my Full Frame, what's the point? You know the answer. But that is not why I got this camera. I wanted a small good image quality camera, with good performance in AF. With the 20 1.7 on this camera , I have what I want. Highly recommend. Rated 5 out of 5 by Newb from My first Micro 4/3 Camera This camera is amazing for such a small size. The build quality is outstanding! It feels great in your hand. I like how much you can customize the camera. Coming from a EOS 50D I was tired of carrying around all the weight, also I as worried it would not hold up to the 50D's image quality but I was wrong it is almost as good. The tilt screen is a must have for me now and I would not buy another camera without one. Rated 5 out of 5 by rafael from gf1 replacement I'm not saying you should replace your gf1 with the e-pl3 but I had no choice as my gf1 was stolen. I am happy after more than a week. I had always been attracted by the pen line but found the autofocus too slow and size too big. This size is almost perfect although a grip would make it more comfortable. The e-pm1 was just too simple for me and not much smaller and with a tilt screen and a few more buttons this was a better choice for me. I use a viewfinder but tilt screen has been great when using my small zipshot tripod. E-p3 is too big. I appreciate the ibis, jpgs and art filters that come with the pens. Fun. Easy. I am using it with the vf-3 which is better than the one on my previous gf1 and my main way of composing ( hence gf3 was not an option, also due to batt life). Also actually looks good on the e-pl3 in my opinion. Haven't needed the clip on flash but it is small and unobtrusive. Don't really use the kit lens as i have better lenses, but i can say it is fasr and quiet to focus. Don't miss the touchscreen. I am not seeing an improvement in picture quality but it is a little better in low light than the gf1. Love the shutter and overall look. Taking everywhere. Rated 5 out of 5 by dennisk from Best 4/3 camera for me Moving up from a point and shoot camera. I didn't want to carry around the large DSLR camera and all of it's gear on my travels. This camera is exactly what I was hoping for and more. It's even smaller than I imagined though it's bigger than my P&S. The images are so sharp and taking nice usable pictures in low light i.e indoors or sunset are now possible. The camera feels solid and well built. The shutter feels/sounds like my old film SLR camera from 20 years ago which is something I forgot about. I use two hands to shoot so I don't find the need to add a 3rd party grips on the front yet. It took me a while to learn all the buttons and controls and I'm still learning but once you do, it's pretty easy to change the settings. I don't even want to imagine how long it would have taken me to learn all the buttons on a full sized DSLR! The best feature of the camera... the tilt screen! Rated 5 out of 5 by Peter from Quick focus. Customizable interface I've had this camera about a week and I must say it out performs my Canon D-20 at less than half the size. Quick focus and customizable interface. The picture quality is excellent. I have upgraded by adding the VF-3 and a Panny 20mm f1.7 pancake lens. Great combination for most situations using natural light. The small size takes some getting used to. Awaiting the release for sale of the waterproof case.